LeBron James came through HUGE for the Miami Heat last night in Game 5. It was easy to see why he was named MVP of the 2012 NBA Finals. LeBron scored 26 points, grabbed 11 rebounds and dished out 13 assists in the 121-106 win over the overwhelmed Oklahoma City Thunder. Last night was truly a coronation moment for “The King”, and consider me a witness. I am really proud of LeBron for putting the horror that was last year’s Finals where he became the “Frozen One” (courtesy of Skip Bayless) against the Dallas Mavericks. A lot of cats would have crawled up somewhere never to be found again. Not LeBron. It took him a little while to get going this season, but he nevertheless did his thing and practically carried the Heat to the NBA title. While I think he will win at least two more titles, mainly because the competition is scarce outside of OKC. Should anyone in the East scare Miami, even Chicago with a healthy Derrick Rose? The West is a bit deeper, but Miami should not be intimidated, no matter the foe. 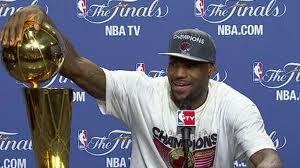 Congrats again to LeBron. He said it best after the game: it’s about damn time. Lebron earned this championship and while I’m not a huge James fan, there’s no doubt Lebron is the best bb player in the league and as long as another contender doesn’t make a serious commitment to defense, Lebron might find himself the holder of several trophies over the next 5+ years. Backing up the smack talk of 7 championships might be a little far fetched. My bet is a young team like Indiana or OKC make a personnel change here or there and find out a way to dethrone Miami next year.